“Our shelter has seen a real change in what animals come into the shelter. Years ago there were lots of puppies and kittens pushing us past capacity and having to develop and rely on a solid foster program for the overflow of these young animals. Through working with veterinarians with education on spaying and neutering pets before 6 months, as well as working with the municipalities to develop programs and solidify grants for low cost spay and neuter programs, and through education and financial programs we have seen that the sheer numbers of puppies and kittens has diminished significantly. “What we are seeing now, is a lot of middle-aged animals that have chronic conditions such as skin issues, or re occurring ear infections, urinary issues and such. Where owners are frustrated and no longer feel they can go on dealing with this, or are not able to financially. Another common one is major dental disease in both cats and dogs. The owners are not able to afford the fees for the required dental care and therefore surrender the animal. “Due to these cases where there is major dental work or a lot of diagnostic work-up to identify the problem and then do treatment our medical costs are sky high. The proceeds from your purchase will help our animals in need. The beautiful artwork is by Lili Chin and is loosely based on two of my own animals that I adopted from the shelter. 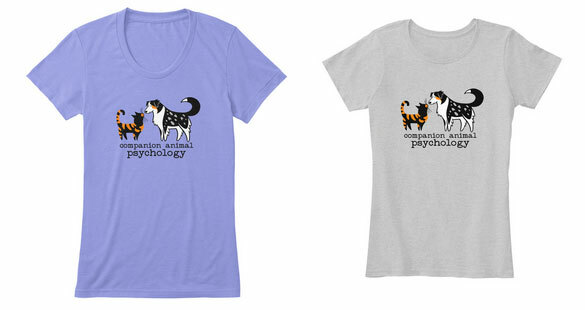 The t-shirt is available in round-neck and v-neck in both women’s and men’s styles, and a range of colours. The hoodie comes as a pullover style or as a zip hoodie with a back print. Thank you for your purchase, and please share with your friends too.